The strong touring presence of the flourishing Canadian folk and roots music scene continues to go from strength to strength as Alberta born and raised artist Cara Luft returns to the UK for a month-long promotion of her new CD culminating in an appearance at the annual Canada Day celebration in London in early July. After the unfortunate scenario of being unable to attend either of the Midlands gigs on this tour, an opportunity to catch her show at Bishop Auckland while on a short break in the North East was one not to be missed and ultimately a very rewarding experience. Cara’s two-set show formed part of a small monthly gathering of folk fans in the Town Hall bar of this County Durham market town and her brand of rock infused folk and roots music entertained those present who were probably more used to the rich vein of local artists participating in the art of performing traditional music. Accompanied only by the exchange of guitar and banjo, along with a catalogue of quality songs and an effervescent personality, Cara showed why she is a valued and respected member of this music movement. Although the bulk of the night was to be devoted to the songs from her new record titled ‘Darlingford’, Cara chose to open the evening with ‘There’s a Train’, a track from her previous album, ‘The Light Fantastic’ and the up tempo strumming that accompanies this song set the tone for what we would expect for the rest of the evening. There are certainly elements of her rock influences in a playing style that sets her apart from other artists in the genre and this adds a little originality to her interpretations of traditional music. Other tracks played from this 2008 album in the opening set were also of a similar style, these being ‘No Friend of Mine’ and ‘Black Water Side’, the latter paying tribute to the diverse interpretations of a traditional song by Bert Jansch and Jimmy Page . A strong and enlightening feature of a Cara Luft show is the vivid background stories that introduce many of the songs and, with a new album to promote, there was no shortage of fascinating ones on this pleasant June evening. 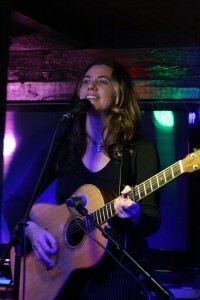 Therefore during the first half of the show we learnt of Cara’s right wing fundamentalist aunt, the subject of ‘Idaho’ and of the US/Canadian border crossing unintentional smuggling saga that became the origin of the popular audience participation favourite ‘Charged’, of which a live version appears on the new album and a You Tube clip featuring prominently on her website. Perhaps the stand out number from this segment of the evening was the new song ‘My Darling One’ with its infectious chorus line. After commencing the second set with the song ‘Holding On’, so new it’s yet to appear on any record, Cara chose to focus solely on the new album with such numbers inspired by Canadian UN humanitarian Romeo Dallaire whose experiences in war torn Rwanda were reflected in a song simply titled ‘Dallaire’, while a more personal relationship was recounted in ‘House on Fire’. Cara loves to delve into traditional music and followed her rendition of the old English folk song ‘The Ploughboy and the Cockney’ in the first set with an interpretation of ‘He Moved through the Fair’ in the second. However there was time for one final twist as the encore consisted of a banjo rework of rock classic ‘Sweet Child of Mine’, a light hearted feature of Cara’s sessions back home with this much maligned but beautiful traditional instrument. There are still plenty of opportunities to enjoy a delightful musical evening in the company of Cara Luft as she continues to extensively travel the UK this June including appearances at the fantastic Maverick festival at the end of the month, and investing a little bit of money and time will certainly not see you disappointed.